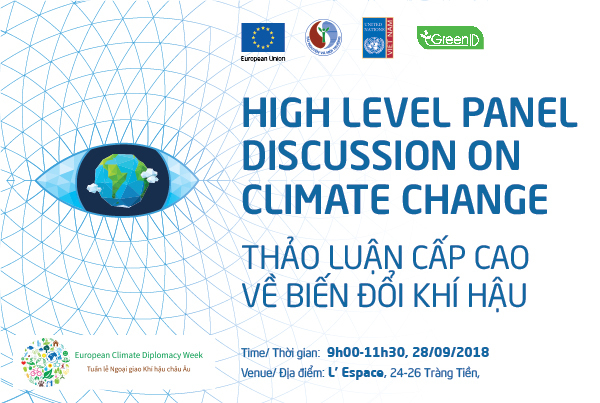 In the context of the EU Climate Diplomacy week, the European Delegation to Vietnam, in cooperation with the Ministry of Natural Resources and Environment (MONRE) is organizing a high level planel discussion on climate change to raise public awareness on the urgent need to collectively addressing climate change. The event will take place at L'Espace, 24-26 Trang Tien Str., Hà Nội. The meeting, entitled "Climate Change: Where do we stand, where do we go and how?" is chaired by a Vice Minister of the Ministry of Natural Resources and Environment, EU Ambassador Bruno Angelet, UNDP Resident Representative to Viet Nam Mr. Kamal Malhotra and Green ID Director Nguy Thi Khanh. It discusses the state of play of Paris Agreement, the situation in Vietnam, the work conducted by the EU inside and outside its boarder, and the role of the civil society in addressing climate change. At the event, there will be a mini exhibition on the actions of the EU, EU Member States, MONRE and Civil Society Organizations on climate change.